We have been asked if there are graphics related to G-Lab that SSI Associates can use as a starting point for creating their own G-Lab presentations for schools or local groups. Yes! And we’ll even give you a starting point script. On this page is a transcription of the G-Lab segment from SSI President Gary C Hudson’s February 2017 Silicon Valley Space Center/AIAA-SF TechTalk. We’ve put the most recent G-Lab slide images at the appropriate places. The page shows the slide images at 400px width to fit our web text area but right-click downloading will give you the full size files. For an example of flow, at the bottom of the page is an embedded video from the SSI YouTube Channel set to automatically start at the G-Lab segment start (9:27) and automatically end at it’s conclusion (31:01). We hope this helps and we ask that if you are proud of any graphics that you create for your own presentations, please let us know so that we can share them with your fellow SSI Associates! That’s pretty extraordinary. That began with the Bush Vision for Space Exploration after the Columbia accident in 2003 and was a extended into the Obama administration. “In ways that are even indefinite.” I mean, that’s a pretty extraordinary statement. So, taking that as national space policy, then we looked at the Decadal Survey on Biological and Physical Sciences that was done in 2011 and they keep coming back every decade saying we need study gravitational biology in space. And NASA says ‘thank you for your report’ and puts on the shelf, and decade later they come back and say we need to study gravitational biology in space. And the report goes on the shelf again. And this is been the case pretty much since the dawn of of NASA and the space age. 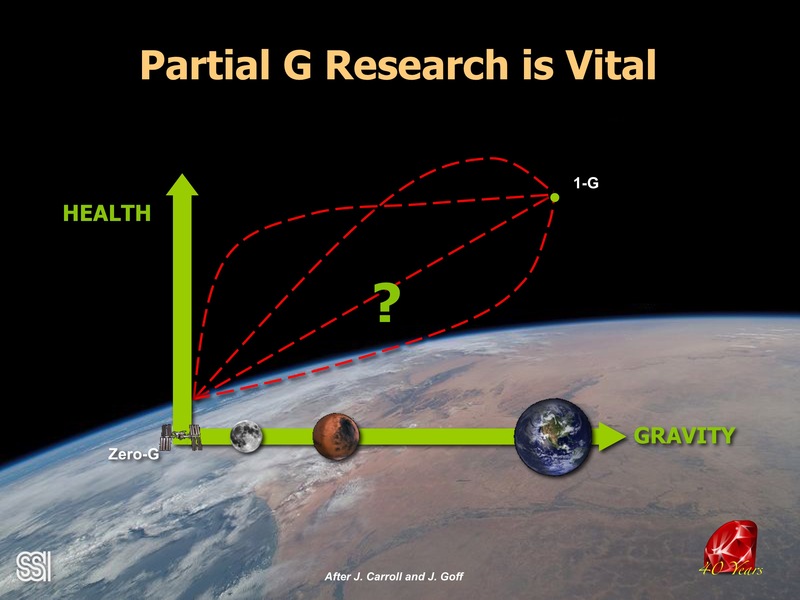 So why is partial G research important? 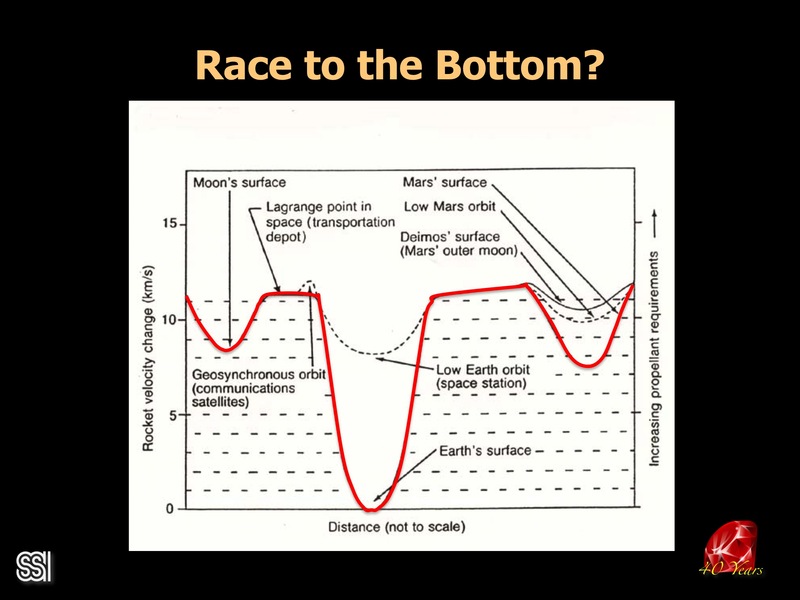 The reason is clear when you look at this… this is health (on the left) and this is gravity (along the bottom) going from zero G at ISS, to the moon and Mars roughly a third gravity to Earth. We have no idea what the shape of this curve is. We know that you could be at optimum health at one G at Earth. We know that zero G is very dangerous for you – there are lots and lots of lots of changes that occur and none of them are good. Unlike early science fiction writers who thought we might live forever in low G environments, no, you’re only gonna live for a couple of years. And most of us wouldn’t survive even a year in a low G environment. So is this a linear shape? Is it one of those things where just a little bit of gravity restores you mostly to health? What is the shape of the curve? A half a trillion dollars and a half of a century after the dawn of the space age, we do not know the answer to this most fundamental question about human existence in space. 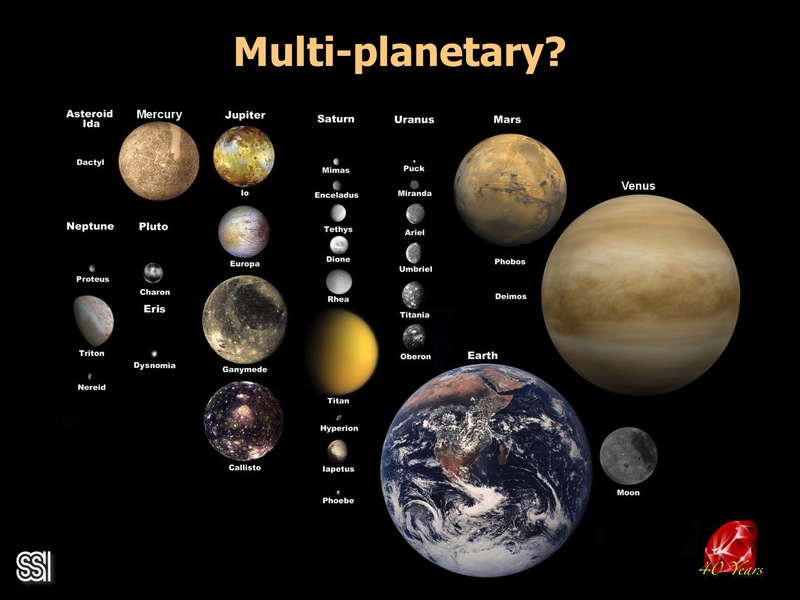 Can we live on any planetary surface other than Earth’s? Some people talk about us becoming a multi planetary civilization. I won’t say who, everybody in this room knows. These are the moons and planets of the solar system. This blue one is the one that’s got one G. Venus, which right now I’m not ambitious enough to want to terraform, comes close. 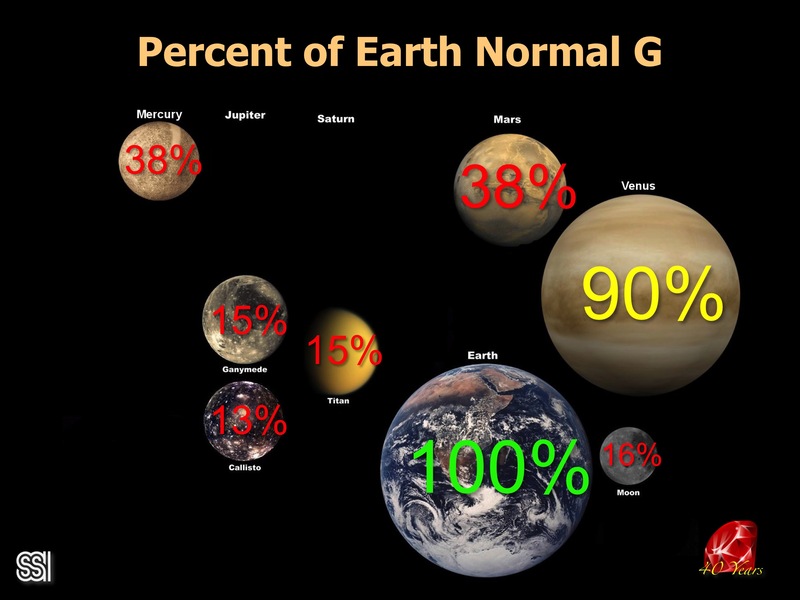 Mars is only 38 percent of normal G, the moon only 16 percent and Titan and the two large Galilean satellites are about the same at about 15 percent. There actually are 2 places where you could survive at almost one G; either just a little bit less or a little bit more beyond Earth. 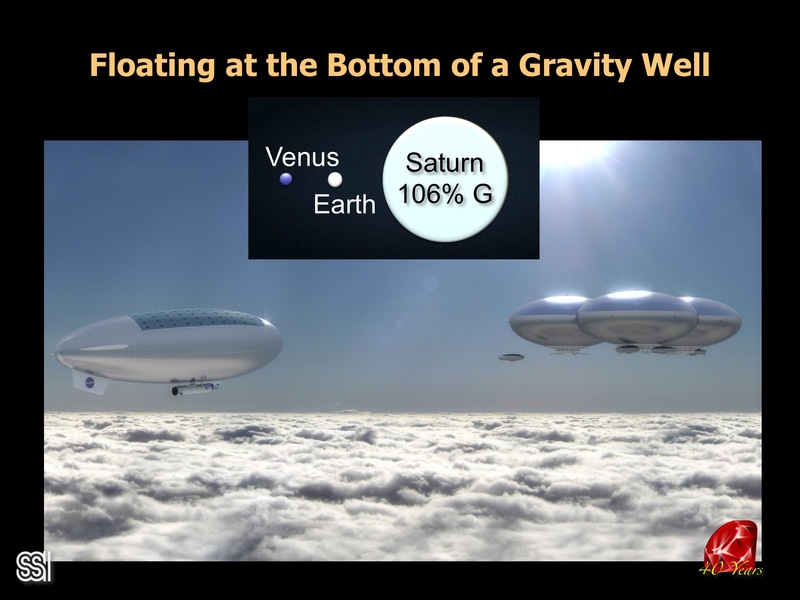 One, of course, is Venus and as I said nobody wants to terraform it, but you could live above the cloud decks of Venus. Watch that first step however, because the sulfuric acid clouds are are below you and I can imagine the smell must be pretty bad. 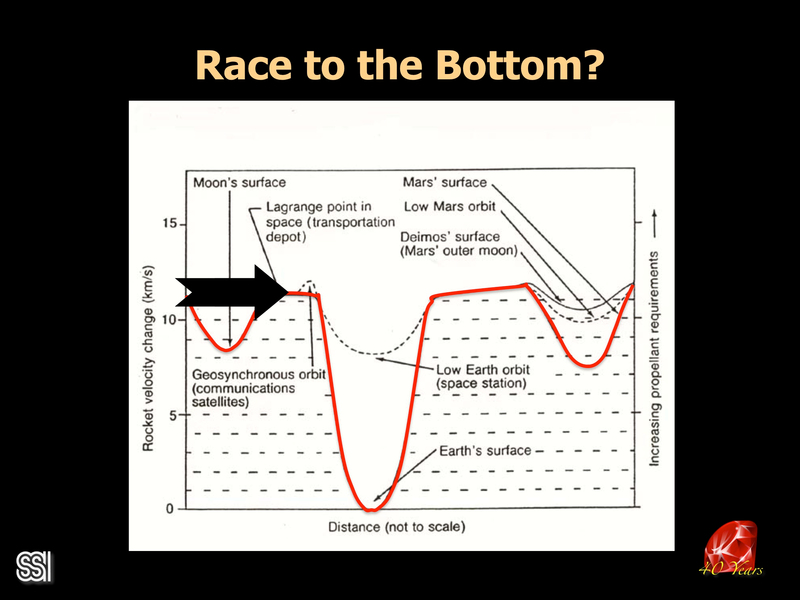 But once again you’re at the bottom of one G gravity well. The other option: The cloud decks of Saturn and a hot air balloon structure. If any of you remember Buckminster Fuller and hot air domes that would be levitated, you know, half mile wide domes that would be levitated over Manhattan by just the hot air rising within the the dome? Well you could do exactly the same thing in the Saturnian atmosphere. I have a lovely very tiny painting from Ron Miller, an original Ron Miller, that shows the upper cloud decks of Saturn as viewed right in the ring plane so the the ring is just bisecting and the sun is moving behind it ; there’s a beautiful sun dog and it’s a lovely site. And I could imagine a floating city in the Saturnian atmosphere. 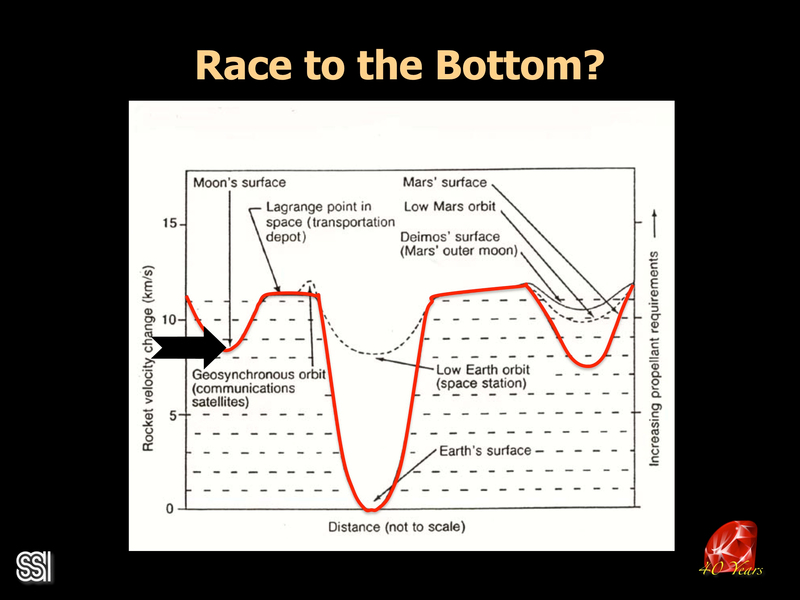 Whether or not you could build a civilization at the bottom of that gravity well floating is another matter altogether, but those are the two places besides Earth , Venus and Saturn, where you could potentially get approximately one G.
Now as I said at the outside, O’Neill felt that a technological civilization, especially an expanding one, should not operate at the bottom of gravity well. That your heavy industrial capability, for access to energy and raw materials and resources that are available on a timescale of centuries and millennia, you really need to be in free space. There’s plenty of resources there from cometary debris to asteroidal material. You don’t necessarily have to do what Gerry was looking at which is taking material off the lunar surface and and taking it into free space, you can access it directly. So this is what we would like, and when I say “We” I talk about SSI and adherents of this particular non planetary bias in moving off Earth. This is the Stanford Torus concept that was developed around 1975 here in the bay area at a summer study program. This sort of mini ring world could support between 10 and 100,000 people, you could you could build one after another and in fact the first settlement’s revenue comes from building the next settlements. If you think that that’s absurd, a friend of mine gave a talk a couple of years ago where he pointed out something that I had no clue about, which is that at the time of the American Revolution New England farmers would farm during the growing season but then winter would come. What do you do when it’s winter in New England? Well, it turns out what you do is you build ships. And 75 percent of the bottoms built in 1775 that were part of either the Royal Navy Men At War or the merchant fleet of the United Kingdom were built in New England. 75 percent were built in the colonies, and that’s for one simple reason. Trees. There are lots of lots and lots of trees and New England and there were relatively little left in England. So those farmers would put down their plows and they would go into the shipyards and they would build ships. 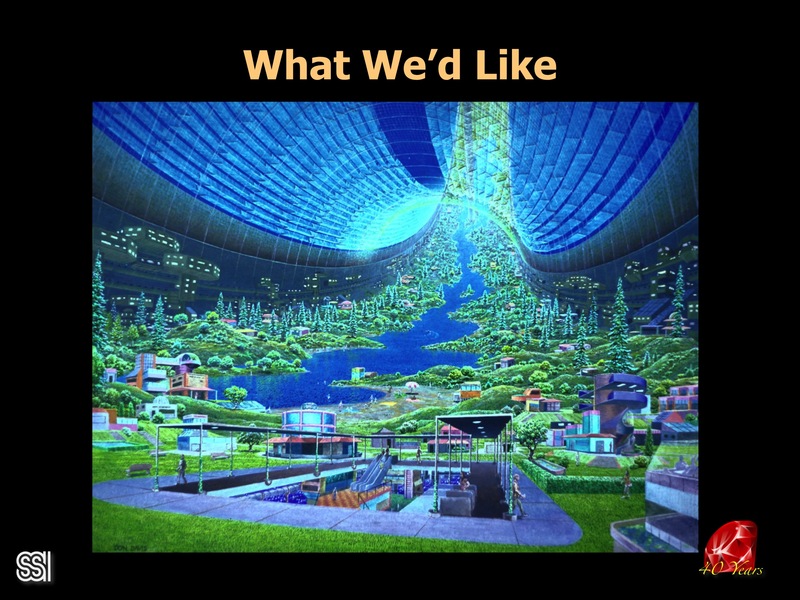 And so when people say what is this space settlement going to do, it it’s basically going to build more real estate. And it’s a self perpetuating business. Anyway, one of the forms of what are called “O’Neill Colonies” is the type of thing I think we would like to see. 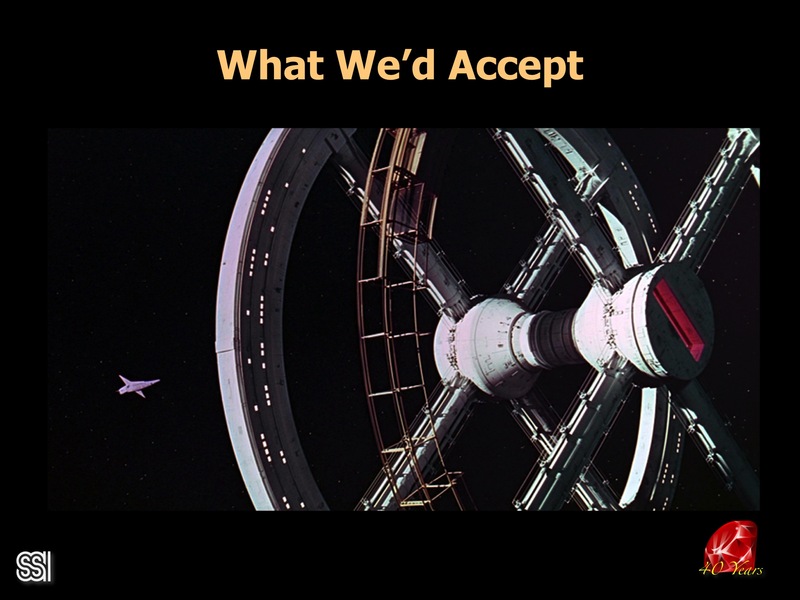 And what would we accept in the next 50 years? Well, space version 5 from 2001. That would be fine for me. You know, a kilometer in diameter, several hundred or several thousand people in space. When I saw 2001 when I was 18 and 1968 I thought this was 10 years into our future, now here we are 50 years later and and it still 50 years into our future. This of course is Werner von Braun, who I will really date myself by saying I knew. This is his rotating space station concept. 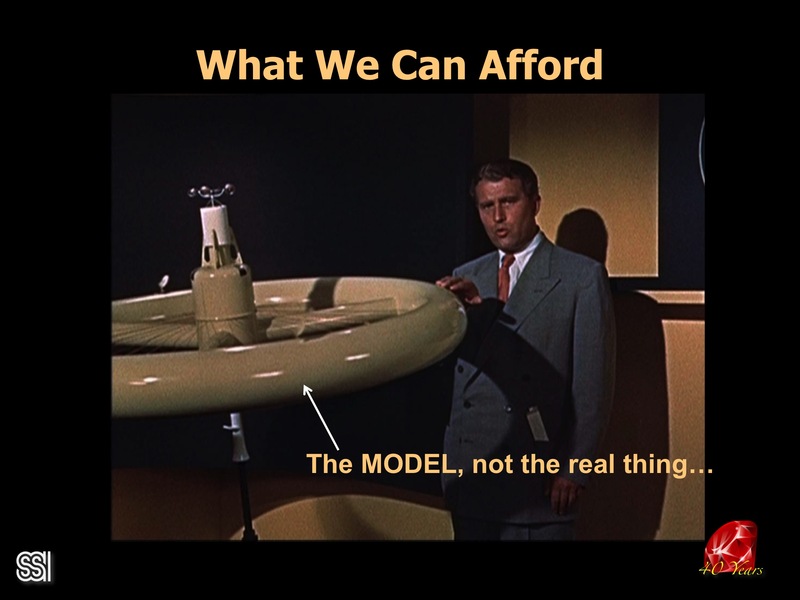 Now, what we can really afford is the model. Not the real thing. There’s literally that little money going into any analysis of a rotating structure in space that provides artificial G.
By the way, for those of you who were born after the Apollo landings, this little thing in his pocket? That’s a slide rule. 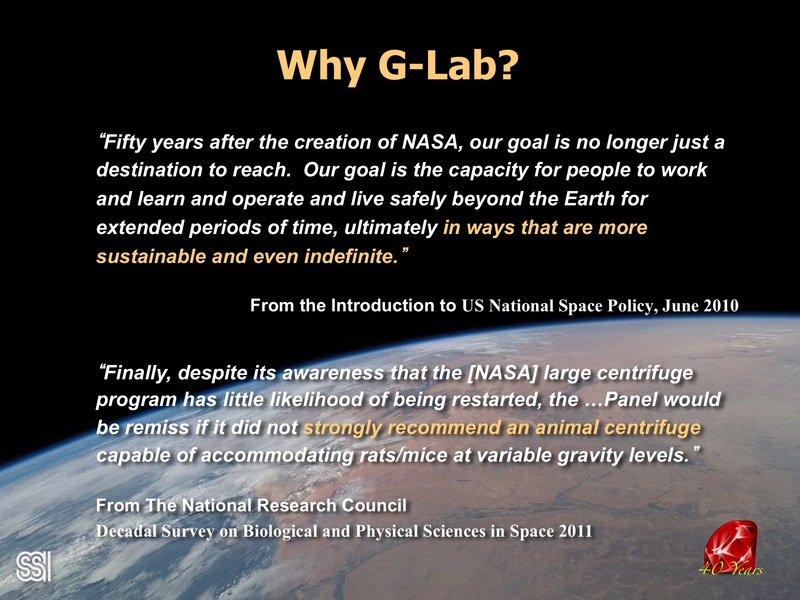 So, we came up with this idea that we really need a G-Lab. We need a multi generational vertebrate mammal experimentation. And we need to see what happens when you impregnate an animal and raise offspring to term and then that offspring gets pregnant and that goes on and on. And you just keep that up for like 10 generations so that we can see what’s happening in the long term epigenetic analysis. People have said to me: ‘Well, that’s too ambitious.” And I grant that it is very ambitious, it’s aiming at the stars, right? And they say: ‘Why don’t you do something smaller? You know, fruit flies?’ Because it doesn’t have a spine. Okay? If it doesn’t have a spine, if it’s got an exoskeleton then I don’t care about it. They say: ‘Worms, Sea Elegans.’ Well they’re worms. No spine. Okay? No calcium metabolism the same way that we have calcium metabolism. So. 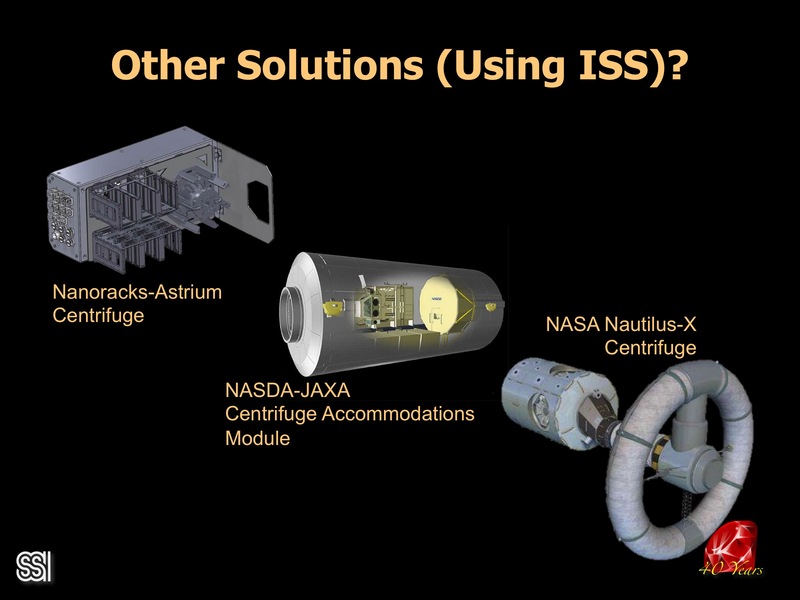 There’s a centrifuge that the Nanoracks folks and Astrium have put on board ISS, it’s available and you can hire it out. The Japanese space agency cooperatively actually physically developed a 2.5 meters centrifuge for NASA to plug onto ISS and it was supposed to fly in 2005. You know where it is right now? It’s rotting away in their parking lot at Tsukuba, the Japanese science city, because NASA didn’t want to put it on ISS. And I’ll get to the reason why. And people have looked at larger centrifuges as well but those are just Not going to happen. 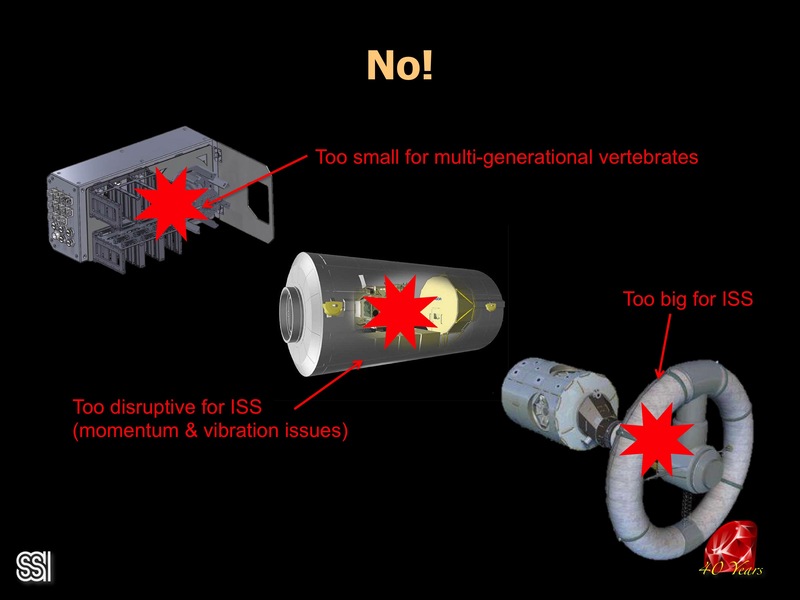 This one [Nanorack-Astrium] is too small for multi generational vertebrates. This one [NASDA-JAXA] the Japanese one or the big inflated one is too big for ISS and the reason is pretty simple I mean you’ve got to understand that ISS has got a big microgravity research component and a number other things where pointing of the spacecraft is important. If you have a two and a half meter one metric ton centrifuge spinning on ISS and you have one of them then ISS goes wherever this thing wants to go. Okay? This is the largest momentum device onboard the ISS and so however it wishes to go through inertial space around the earth ISS is gonna follow. And this upsets people. The vibration upsets microgravity experimentation and so forth so it just, it just got killed. So you cannot connect a centrifuge to ISS, it’s just not going to work.. So we need a dedicated free flyer. 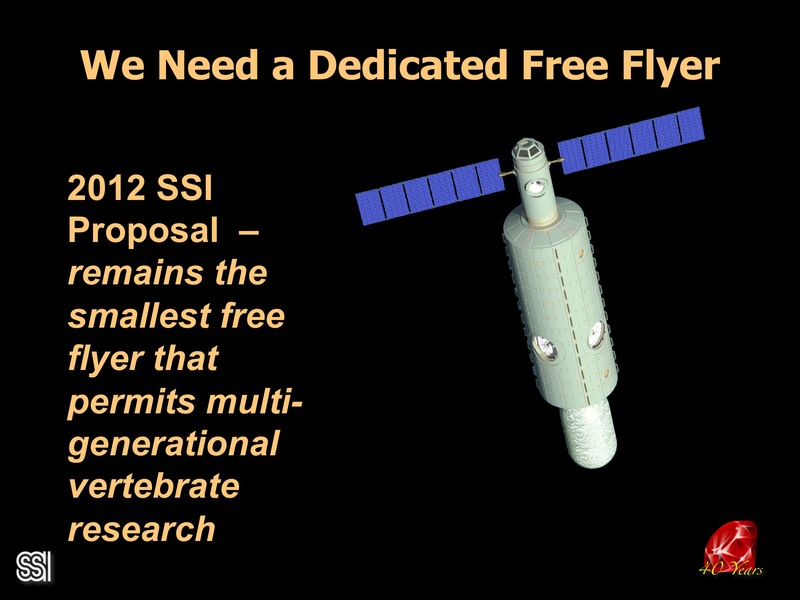 In 2012 I proposed this dedicated free flyer launched on a Falcon Heavy or something comparable. It’s about 5 meters in diameter, it is meant to have a human crew – either Human tended or “Man tended” as they say – where you you fly up to ISS but you take a tug across to this thing or have it come and not dock but stand off like a kilometer or two from ISS where you could do a a spacesuited transfer. Exactly how you operate under these conditions co-orbital with ISS is all TBD. But something like this is necessary, some sort of free flyer is required. So I looked at how you might go about launching this and of course the Falcon Heavy is one option – it’s only 4 years overdue at this point but I really can’t blame SpaceX for that as they’ve had a lot on their plate. 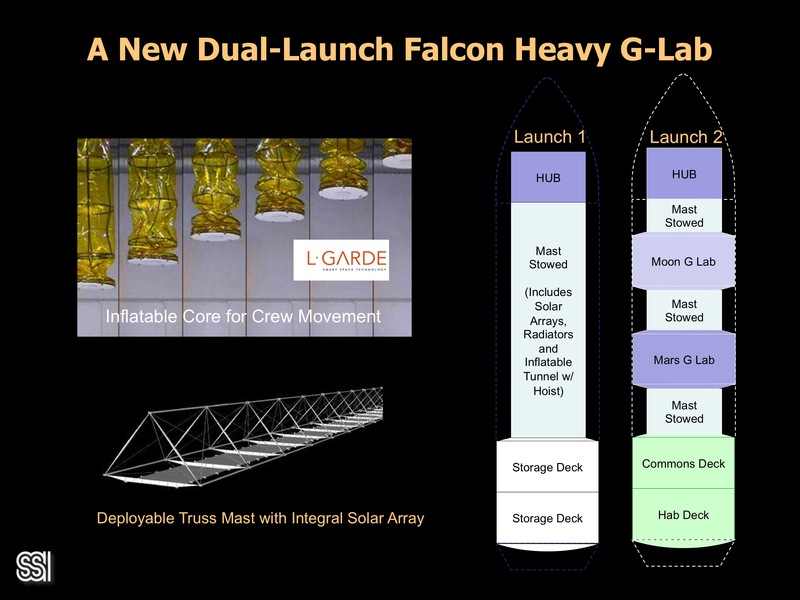 But now we have a competitor in Blue Origin which has even a larger vehicle with New Glenn which can carry more than a Falcon Heavy and has a much larger diameter. This is a Skylab equivalent diameter up here [on the New Glenn], 22 feet or 6.5 meters. So we could imagine a situation where there’s a free flyer that’s got multiple centrifuges. So you have a counter rotating one so you can deal with momentum balance. You’ve got storage decks, a docking deck and you have a habitation deck so this could be permanently crewed if you want to do that. And I looked at what this might cost. It’s not cheap but it IS cheap by any NASA standard or any government Space standard at, we think, about two hundred million-ish dollars to do. It’s a SpaceX-y style operation. But that does not count launch, it does not count operations. So we figured some sort of public-private partnership where somebody launches it, some government launches it, it goes up on an Ariane 5 perhaps like the Webb space telescope and then it is serviced cooperatively by other space agencies like the Japanese or Europeans or NASA. Now, having a co-orbital with ISS means anytime a Dragon, a Progress, a Soyuz or whatever ends up docking to ISS it can be carried cargo and supplies and material for this co-orbital station because from a delta V standpoint, from a change in velocity standpoint, we’re talking a few meters per second to go from ISS to a co-orbiting station that’s maybe trailing like 20 or 30 kilometers for safe keeping. So you become a destination almost like an industrial park that you can just visit on a routine basis. By the way I asked Elon to give us a free Falcon Heavy launch and his response was ‘It’s not a priority for us to answer this question. We’re going to Mars.’ Well, it’s very likely in some biologists’ view that 5 years after you go to Mars no one is alive. Yeah. And the real question is are you going to sterilize everyone who goes? If they’re pregnant on the way or they get pregnant when they’re there and they have a child what is that child going to do growing up in 38 percent of a G? You can fix everything else about Mars. You can dig 7 meters down so you can deal with the radiation which is worse than the moon. You can never go outside so you don’t have to deal with the perchlorates in the soil. You could have solar power plants or nuclear power plants or whatever to get your energy. But you cannot change the G. There’s no practical way to do that. 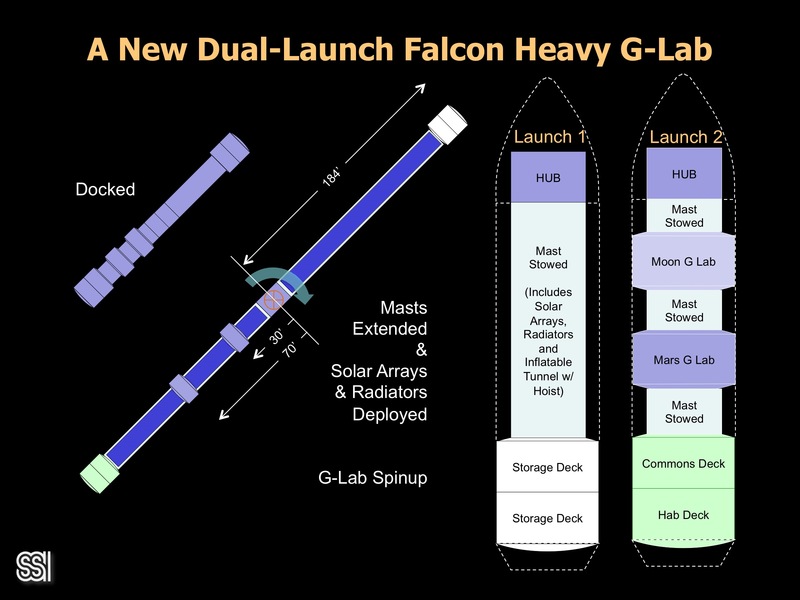 Anyway, so I said what about given how cheap Falcon Heavy launches are and the fact that the New Glenn is coming along and it’s going to be even more competitive on a dollars per pound delivered payload to orbit, what if we do something where we spun the entire station to get the G that we want? So this is a two launch system. It uses an expandable boom, these are used quite frequently on on spacecraft of one type or another and a lot on ISS, and inflatable cores that allow you to communicate between a habitation and commons deck here. So once this mast is expanded you now can get to Mars G-Lab, then the mast spans again and you can get the lunar G-Lab, and the mast expands again and you can get to the hub and then you make the hub here and you’ve got a long tunnel to a storage counterweight. 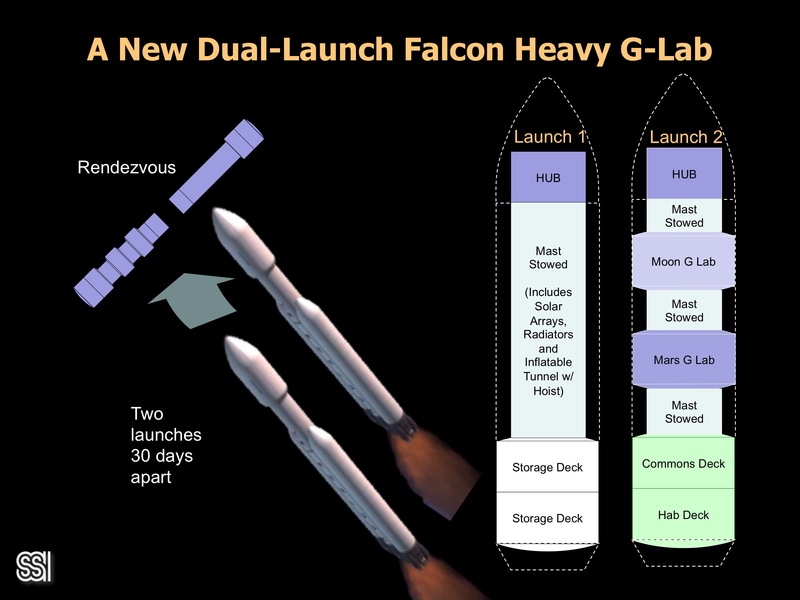 And that’s how you get your artificial G.
So you do 2 launches with Falcon Heavies or New Glenns. You rendezvous in orbit, you launch perhaps 30 days apart and these are uncrewed launches. You come together in an automated fashion and dock. You extend the mass and you spin up. And instantly you have the elements of Space Station 5 – the first structure of Space Station 5. And you can add to this, you can go out and then you can of course build around. So this is ridiculously ambitious. Unless some Silicon Valley or Seattle or New York billionaire wants to fund it. On the other hand, it will cost less to do this than one flight of SLS. Literally one flight of SLS. This is cheaper. And if you weigh the benefit from doing one flight of SLS against the benefit of answering the most fundamental question about human biology in space that there is… I think the answer’s pretty obvious for what you need to do. So, I would close this part of the talk by saying that Jerry Pournelle back when he ran the Citizens’ Space Advisory Council, the National Space Advisory Council, of which I was proud to be a member, and we used to advise President Reagan once a year for eight years on what the US should be doing in Space, the opening cover letter that Jerry would send along with the information to the president had the the tagline: “The politician, the Statesman, who takes humanity into Space permanently will be remembered when Isabella The Great is long forgotten.” Because this is a future for humanity that stretches out not just hundreds or thousands of years but millions. Once you get off planet. So, my view is: The Entrepreneur, the Billionaire, the Philanthropist who funds the G-Lab – and puts it into practice – their name will go down in history along with Armstrong and Aldrin and Collins as taking the first major step off of this planet. February 2017 SSI President Gary C Hudson addressed the Silicon Valley Space Center as part of the SVSC/AIAA-SF TechTalks series. 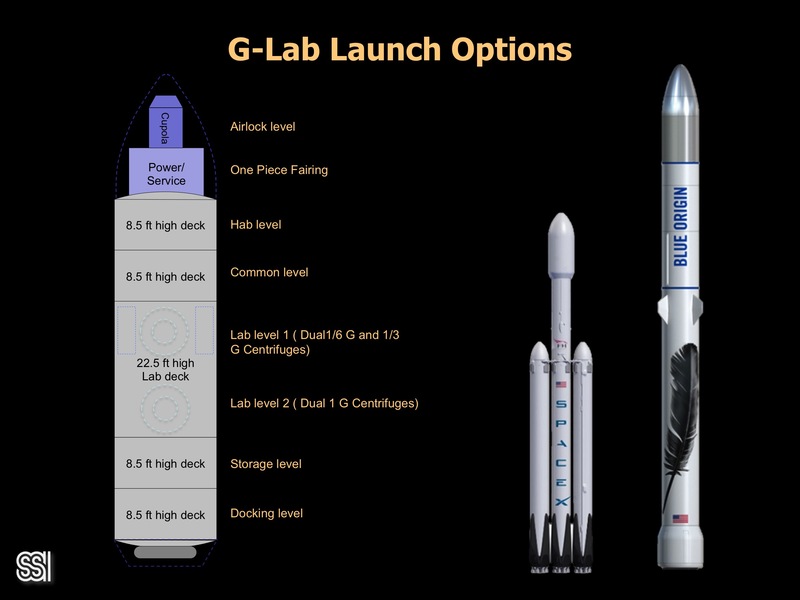 The middle of this hour long talk was an overview of G-Lab and featured some new launch and design options. The video embedded above is set to start at the beginning of the G-Lab section (9:27)and automatically end at that section’s conclusion (31:01). Contribute to the work on the very important and timely free-orbiting reduced gravity laboratory: “SSI G-Lab.” Click the button below and fill in the amount you wish to contribute.